Kept having to add coolant to a brand new car. 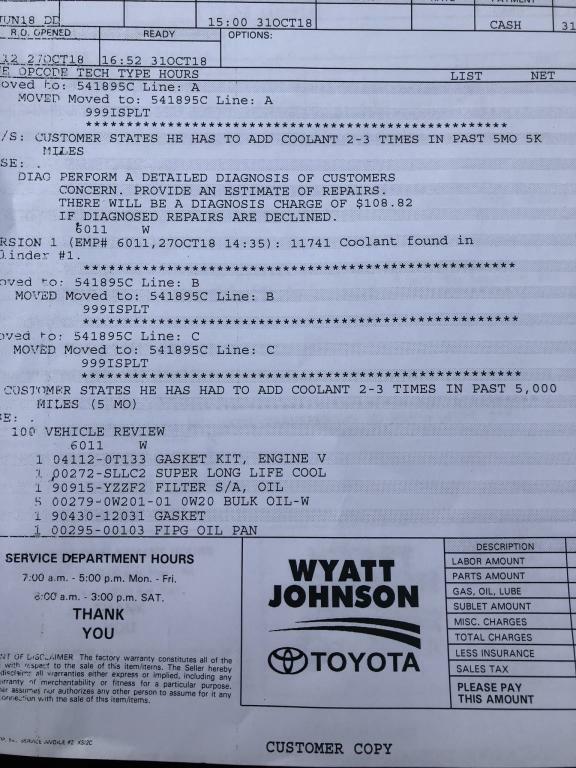 Finally had the car inspected by Toyota and it has coolant in cylinder 1. This car hasn’t been doing this since atleast 5000 miles. So frustrating. They told me to take the car home over the weekend and bring the car back Tuesday and I could get a rental. Seems like this is putting more wear than necessary on the engine. Update from Nov 11, 2018: The dealer replaced the head gasket. No other work was done to the engine so hopefully it was just a faulty gasket and not a warped head or other engine problem that will cause this again. The repair took about 36 hours, even though I was told it was a 1-2 week repair time. So when I got my rental that my dealer supplied, I naturally filled the tank with gas since I’d have it for at least a week. 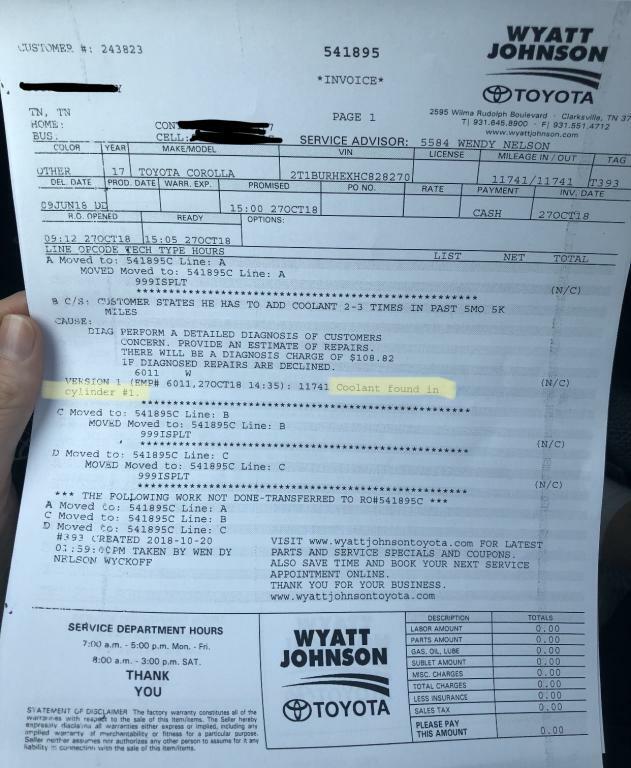 A day later I had to bring the rental back and was out $45 and the rental company got a tank of gas for free.. Not sure why the actual repair time and the estimated repair time were so far off but it honestly leads me to believe the work was rushed and that doesn’t sit well with me. I bought this new car, in part, because we take long trips from Tennessee to New York a couple times a year. I was tired of renting cars, but now it looks like I will be renting again when we drive to New York for Christmas because I honestly do no trust my new car on long trips anymore. I will probably be selling the car as soon as possible.